It can be said that getting a better fit on your bike is more important than losing a few grams of weight. The power in both your downward and upward pedal stroke is crucial to maintaining maximum wattage throughout your Time Trial. 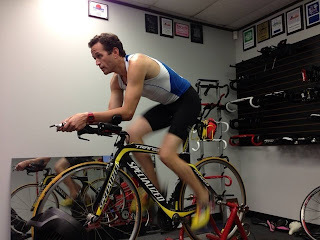 Ceramic bearings, deep carbon wheels, and other lightweight aerodynamic gear are all important, but the first step to improving your bike split of your next Triathlon should be your fit on the bike. To get a good fit, you should seek the help of a professional. I'm lucky that I live in a town where cycling and triathlon are popular sports. You can find a bike shop within a couple of miles from where ever you are in Houston, but it should be said that not all Bike Shops are created equal. When seeking out the aid of a professional bike fitter, you should go to one who is proven in their fitting, has a certification on the tools they use, (and even better) regularly fits cyclists who race professionally in whatever sport you are racing. These are only a few things that can be tweaked to help with your comfort on the bike as well as your pedal stroke efficiency. At the very least, you will feel better on the bike and able to put in those 5 hour rides with no problem!